Anyone who went to a Catholic high school will recognize many scenes from the new movie Lady Bird. Lady Bird tells the story of Christine McPherson’s 2002-2003 senior year in Catholic girls’ high school in Sacramento. It’s in close proximity to a Catholic boys’ high school, so that the boys and girls go to Mass together, and participate in extra-curricular activities, such as a drama club. Christine, well played by Saoirse Ronan, announces at every opportunity that she no longer wants to be called the name her parents gave her. Instead, she wishes to be called Lady Bird, a name she gives herself. Most of her teachers, friends, and family members oblige. Writer-director Greta Gerwig, gets the Catholic school vibes down well, from the Masses and hymns, to religious sisters and priests who are ever present. (I understand that the movie is semi-autobiographical.) I’m happy to say that, unlike many contemporary movies, the sisters and priests do not come across as monsters or predators, but as ordinary people, with their own personalities. One of the funniest is a priest who coaches football and also takes over directing a play when the regular priest-director becomes ill. He directs the play as if he’s coaching football, to the confusion of the students. At school, Lady Bird is not a great student. However she wants desperately to escape Sacramento and attend a college on the East Coast. Her mother Marion (well played by Laurie Metcalf) is a psychiatric nurse, who often works two shifts to make ends meet. Her father Larry (Tracy Letts) suffers from depression and is often unemployed. Lady Bird knows that she will have to receive a scholarship/financial aid package to go away to college. Marion objects, saying that, with her grades and the family’s financial status, Lady Bird can stay home and attend nearby UC Davis. 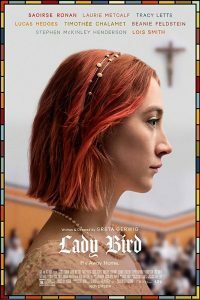 Lady Bird is a rebellious girl, who consumes unconsecrated Communion hosts and is extremely disrespectful to a pro-life speaker at school, leading to her suspension. She has experiences with two boyfriends, including an unsatisfactory (and semi-explicit) sexual encounter with one. Lady Bird is embarrassed that she lives in a modest house “on the other side of the tracks” and desires to be friends with Jenna, a pretty, cool, and wealthy girl, paying little attention to her longtime friend Julie, who is overweight and lives in a modest apartment with her mother. Lady Bird’s relationship with her mother is complicated. Marion is described as “warm but scary.” She loves her daughter, but is overly critical, demanding, and is unable to tell Lady Bird that she loves her. Larry is the one who offers her the most emotional support, remembering her birthday and, without telling Marion, completing financial reports to assist Lady Bird’s financial aid applications. Lady Bird, who isn’t Catholic, sometimes complains about having to go to Catholic school. Yet, as mentioned, I didn’t find the movie to be overly critical of Catholicism. Although she wouldn’t admit it at the time, her Catholic school upbringing plays a positive influence on Lady Bird. At a critical moment, Lady Bird leaves Jenna and her wealthy friends and returns to Julie. At the end of the movie, when Lady Bird is released from a hospital for excessive drinking on a Sunday morning, she goes into a church and listens to the choir. She seems to have a sense of inner peace and comfort. In the final scene, Lady Bird lets Marion know that she loves her. Some years ago, when I often presided and preached at liturgies in a Catholic girls’ high school, one of the students told me: “We act like we’re not listening, but we really are.” I got this impression in Lady Bird as well. While I would caution viewers about scenes of sexuality, drug use, rough language, and consuming unconsecrated hosts, there is also good to be found in Lady Bird. With her rebelliousness, Catholic school upbringing and less than ideal parents, there’s hope at the end that Lady Bird will turn out well.